Care in Action. This is a great local non-profit organization that, by the Grace of God and the generous donations of folks like you and me, closes the gap between women, men and children and hunger and homelessness. Basically, we are trying to build a Multi-purpose Humanitarian Center, which will provide numerous services to help the homeless and ex-prisoners reintegrate back into society. Our services will help them find jobs, and apartments and give people a chance to help themselves. Right now on a weekly basis, we cook more than 450 meals to help feed the homeless. We also try to provide clothing for them and help give baths to the disabled in the streets. Our charity has been around for more than five years, but as you have seen and heard, eradicating sufferation in the world is more than a one man job. We also provide a service to help veterans and we trying to help those in need to become more self-sufficient. Any assistance that can be given to this great cause is much appreciated. We are a nonprofit charitable organization. We perform this work by the Grace of God and for the love of mankind any donations would be greatly appreciated. 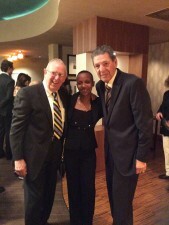 Gloria Lewis is the driving force and heart behind CARE IN ACTION USA and the organization’s first Executive Director. Drawing from her own life struggles and resulting strength, Gloria has become a charismatic beacon of hope for the poor and needy. We love you, and we are honored to partner with you as you follow the Lord & His calling on your life. When you've done everything you can do, that's when GOD will step in and do what you cannot do. Keep faith, for the home this family will receive already has their name on it. All the answers are in Jeremiah 17. Amen. God bless you and continue to help you in this ministry He has given you. The Lord is near, food for the body and the gospel for the soul. Thank you for your concern, caring and love for mankind. The Lord works in many mysterious ways and you are one of them. He has blessed you with a kind heart and loving soul. Anthony is a loving and caring husband and receives little credit, but God is guiding you both and bless you for both for listening to him. Hi Gloria, Keep up the amazing work you do. You’re incredible! "EVERYONE DESERVES A SAFE HOME,"